Here you go, I am doing a 2 in 1 OOTD. 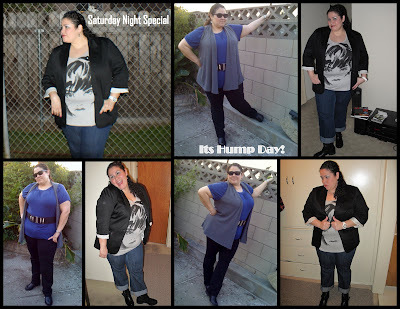 I recently was interviewed by Tiffany from the blog Fat Shopaholic, check it out! One of her questions was, why the lack of OOTD's on my blog which focuses on plus size fashion. I have done a OOTD post before, but didn't really get any comments or responses so I didn't think my readers were interested in seeing my outfits. Take two, I'll try again. Let me know what you think and hope to get some good feedback from you my awesome readers. Wore this outfit to go eat a scrumptious sushi dinner with my sister and mom on Saturday night. We all know Wednesday as hump day, that blah day in the middle of the week. I wore this outfit to go have lunch and do a little shopping with my Friend. Last week I did post about my haul from Faith 21, I finally wore some of the items. Let me know if you enjoy seeing OOTD's, so I can decide to continue doing them or just stick to other fashion related post. I tried to spice up the picture layout as well not to bore you all with just plain ole pics of moi! As always I want to hear your comments, thoughts and feedback. I really like the Saturday Night Special. The hump day look seems to be super comfy. I think you're super adorable so yes MORE OOTD PLEASE! how does teh 3x faith 21 fit you? i wear a 22 im wonderign if i shoud even bother lol it looks so cute with blazer!!! Awesome! OotD are hard for me sometimes because of my schedule, and by the time I get home there's no natural lighting to work with. I plan to have a few more up soon though. I love the blazer/shirt combo! Looking Fab!! I'll do an OOTD one day. lol! Thanks for all the nice and encouraging comments. NikiStar, girl your turning out to be my #1 fan! LOL Love ya! Jennifer & Monique, thanks chicas! I look forward to seeing your future OOTD's! You can do it!